Since the 1973 fiasco of a caucus conducted by the Algonquin Township Republican Central Committee, McHenry County largest township has allowed voters to decide who GOP candidates for township office shall be. That was the year that first-term Assessor Forrest Hare was challenged by a young school teacher. While the caucus looked like a three-precinct primary, after the 3 AM Crystal Lake Community High School Field House results showed the school teacher winning by a handful of votes and even the judges weren’t sure the count was correct, the Central Committee members would not allow a recount. There was no way to legally force a recount, because the committeemen set the rules. At that time losers could run as a write-in and Forrest Hare did. The local Republican Party really took a beating as every weekday it was taken to task by Crystal Lake WIVS Radio station owner Mal Ballairs on his morning talk show. To avoid future similar problems, our State Senator Jack Schaffer and I passed legislation to allow township party organizations to select candidates by citizen votes. When I brought up the idea at Monday night’s meeting in an Algonquin Township Road Commissioner’s building, only I and Lou Anne Majewski remember the 1973 fiasco. 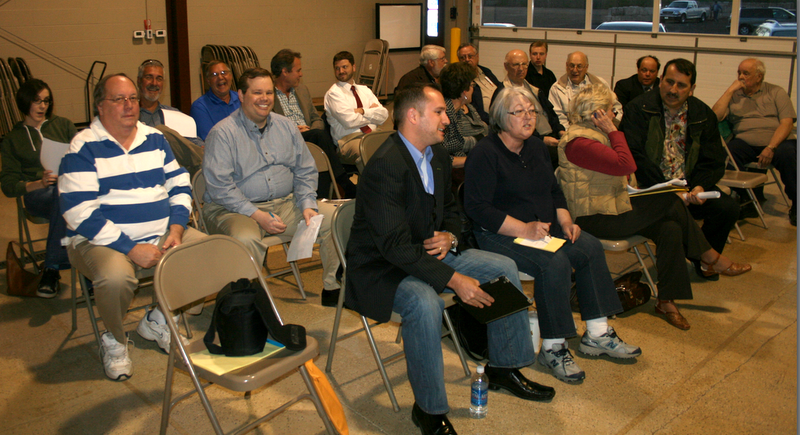 Precinct Committeemen attending the Algonquin Township Republican Central Committee organization meeting on April 9, 2012. I was immediately met with the objection of cost. I couldn’t come up with a figure, but with the low turnout of 19% from both party primaries in March (plus non-partisan only votes on referendums) it’s pretty easy to predict that the turnout will be less when only township officials are on the ballot. The result will be a high cost per vote, which could be lowered if McHenry County Clerk Kathie Schultz can combine precincts. The projected expense was really the only argument. But it was a long discussion. I pointed out that Democrats could have a field day challenging Republican candidates who had been selected in a secret meeting. Conversely, Republicans could make hay of any Democratic Party candidates who were not selected at the ballot box, but rather by party bosses. With township government under attack, I argued, the potential negative publicity would not be helpful. In the end, all of the Algonquin Township Republican Precinct Committeemen present voted to authorize a primary election next February in which candidates for Township Supervisor, Road Commissioner, Assessor, Clerk and Township Trustees would be selected. This is a positive start to open up township government, long overdue, but never too late. Grafton township turnout will run contrary to your expectations. There will be lines waiting to send Moore packing – unless her bond is revoked prior to the next election. Thanks,, Joe; hope you’re right. Low turnouts favor the incumbents.